UPDATE (Spring 2012): After first publishing it in April 2009, I decided to go back and revisit this article and update it to take in to account the releases of Halo 3: ODST and Halo: Reach and all they brought to the table in terms of gameplay. The revision also fixes some formatting issues present in the original version and, due to the size of the article, splits the article into several properly-indexed pages for easier navigation and readability. UPDATE (Summer 2013): The article has been revised to take into account changes in and features introduced by Halo 4 as well as the unveiling of the Xbox One, and to add some other minor revisions. Unless inspiration hits me in regards to writing a story or creating more level designs or a future Halo game gives me some inspiration for new gameplay ideas, this will likely be the last major update to this article. Minor updates may be added to take into account other future developments that render portions of this article obsolete. UPDATE (Winter 2015/2016): This article has been updated to account for changes and new features introduced in Halo 5. I’ve also rewritten and adjusted some other sections to reflect new ideas I’ve had. For me, the Halo series has always stood out from the countless other FPSs out there. The enemy units and the environments you fought them in were inventive and varied. The graphics and art design were wonderful. The sound was great, with the music being some of the greatest to ever grace a video game. The storytelling (at least that in the first two games and in the expanded universe novels) was outstanding as well, with the Haloverse being one of the most well-developed fictional settings in all of video gaming. Also, Bungie set the standard for the FPS genre, with Halo’s blueprint being the template for most modern shooters and the game’s success contributing a major change in the industry. While console FPSs started to emerge during the late 90s on the Nintendo 64 with exclusive titles like GoldenEye (the first successful console FPS), Perfect Dark, and Turok as well as various ports & remakes of PC shooters (e.g., Doom 64, Quake), the genre was still primarily a PC-dominated one throughout the 90s, with the biggest names in the genre including Doom, Quake, Unreal, Duke Nukem, Hexen, and Half-Life. While GoldenEye showed that an FPS could be done on a console, it was Halo that really proved what console FPSs were really capable of, and from that point, the genre began to rapidly shift to a console-dominated one. Ever since the seventh console generation began in 2005, shooters were more likely to be designed first and foremost as console titles than as PC titles (the last notable PC-exclusive FPS was 2007’s Crysis), and many are exclusive to consoles. However, the series has had its ups and downs, with each entry having its own strengths and weaknesses. For example, I feel that the sequels weren’t quite as good in terms of gameplay despite having the same solid controls as well as the high-quality visuals, sound, and music that Bungie is known for, not to mention a couple of interesting new gameplay mechanics. Numerous changes and additions detracted from the gameplay and made for a less enjoyable and sometimes very frustrating experience, though in other ways the sequels surpassed the original. I have written extensive criticisms of the sequels elsewhere, so refer to those for in-depth details (there will be some commentary here as well, however). Of course, while the sequels didn’t quite measure up to the original, Combat Evolved was itself flawed in certain ways, and its follow-ups each had aspects that were the series’ strongest. Halo 1 was strongest on gameplay and had superb writing but its weakest aspect is its age, which results in it being both rough around the edges in certain parts and a comparatively bare-bones affair compared to later Halo titles (no XBL support, for example), though this isn’t exactly a fair comparison. Halo 2 had perhaps the strongest storytelling in the series, just edging out Halo 1. However, it was riddled with glitches, had perhaps the worst weapon set in the series, and was quite simply unfair on Legendary due to outright broken difficulty balancing, plus cheating was rampant online. Time has been fairly kind to Halo 2, though, and its re-release in the Master Chief Collection (which was based on Halo 2 Vista) fixed a couple of more broken aspects of Halo 2’s gameplay. “Super-jumping” is no more, and cheating is all but impossible, but the weapon imbalances and other gameplay issues persist. Halo 3 had a weak storyline but was very strong on extra features, introducing players to Forge and saved films. Halo 3 also improved on Halo 2’s gameplay in certain ways, fixing many of the latter’s most glaring flaws, though it had its own flaws (the AI in Campaign certainly didn’t impress, and the lack of hitscan and reduced aim assist made most weapons extremely inconsistent) and ultimately it still fell short of Halo 1’s gameplay, and in some ways its gameplay has aged worse than Halo 2’s. Reach had much better gameplay than Halo 2 & 3 (but not quite as good as Halo 1) and was even more feature-rich than Halo 3, but it had bad writing (namely retcons that conflicted with the novel The Fall of Reach and other parts of the expanded universe) and several nagging issues in the gameplay department. For example, there are difficulty balancing issues (though nothing quite as severe as Halo 2) and the new armor ability mechanic, while conceptually much better than Halo 3’s equipment, could have been implemented better. Finally, there’s 343 Industry’s Halo games. Halo 4 is… well, it was a step in the wrong direction for the series, I can say that much, and while Halo 5 fixes some of Halo 4’s most glaring faults, it represents a fairly major shift in how Halo plays, and it’s yet another direction I don’t really approve of. While a combination of the best parts of the individual games in the series as well as a refinement of many game elements could benefit a future Halo game, it might not be enough to keep the Halo series on the cutting edge of shooters. Certain aspects of the series as a whole may have to be rethought entirely. If there are going to be other Halo FPSs in the future, perhaps it is time for combat to evolve once again. Of course, evolution has neither a prescribed goal nor a necessary direction, and the branches of the tree of life get pruned whenever a certain evolutionary path reaches a dead end, while other branches spread out and flourish to occupy new niches, and sometimes designs work so well they remain relatively unchanged for ages. When it comes to game design, there is a prescribed goal, but the direction of gameplay’s evolution can and does change. Certain gameplay elements can represent evolutionary dead ends and should be eliminated. Others are interesting yet flawed ideas that could benefit from further refinement to see if they find a comfortable niche. Some aspects of game design work so well they don’t need to be changed much if at all. And sometimes a few throwbacks in gameplay design might be necessary; on occasion, in order to move forward, you need to take a few steps back. In this article, you’ll find my ideas for what I’d like to see for a hypothetical future Halo title. 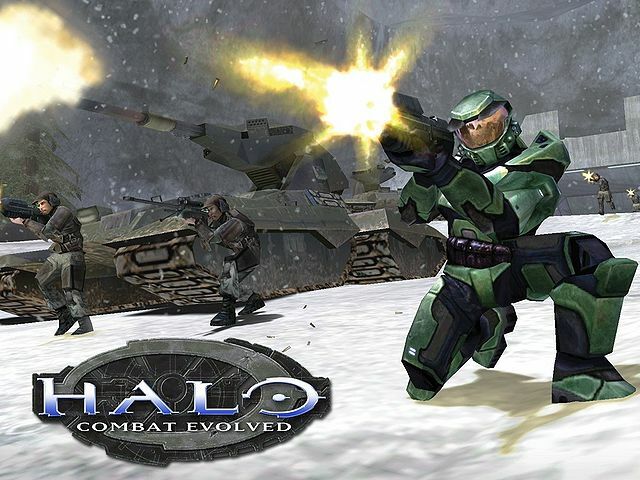 The game would take the best aspects of the Halo series, refine a lot of its core gameplay, and advance in certain ways to keep up with series that have surpassed it in one way or another. In other words, it would combine the latest in cutting-edge technology and advances in game design with the best of the old-school. Story-wise, it would mainly be a side-story to the series and would revolve around new characters. Finally, this game would try to fully utilize the power of the Xbox One, which I would hope offers the horsepower needed to do the things I’d want to do if I could make my own Halo game. As this game exists entirely in my head (and barring some miracle it will remain forever so), not to mention that things that sound good on paper might not necessarily work well in practice, everything in this article is entirely provisional, but at the very least it should give you a general idea of how I would design a Halo game if I got to call all the shots. As for why I chose to do this rather than come up with my own ideas for an original FPS, it’s because the Halo series has, at its roots, a combination of elements — the setting, the pacing, the variety of enemies, the basics of gameplay that I outlined earlier, and so forth — that give it the potential to be far greater than just about any other series of shooters on the market (also, I’m not that great of a writer of fiction). While it is still better than most of the competition in many respects and still remains a unique experience among shooters, it could be so much better, but not only is it falling behind some of its other competitors when it comes to certain elements, particularly stage design, I feel the series is heading in the wrong direction under 343I’s direction. Like most of my other writings, this article is quite lengthy as it addresses almost every single aspect of the game, whether it be technical, gameplay-related, or otherwise. However, this time much of the length (about a third of the page count) derives from detailed stats rather than commentary. There is also a very heavy focus on gameplay rather than narrative, but that’s because I’m a gameplay-first kind of person, so for those looking for a heavy focus on story won’t find much here besides extremely general plot outlines. I’d like to thank Julian Gnam and Alan Chan for the stats they have published on the internet, without which I would not have been able to gain any information regarding things like weapon damage & accuracy or enemy health, among many other stats. Also, thanks to nscuDuncan, whose ideas for armor abilities inspired some of my proposed changes to armor abilities. Finally, thanks to The BS Police for a couple of ideas (which I honestly can’t remember what they were because it was from a conversation years ago; sorry, dude). This entry was posted in Halo, Video Games and tagged Halo, Video games by shadowofthevoid. Bookmark the permalink. Man, I am going to have to make a dent in this beast of a post at some point. I just stopped by to let you know of a few things. I’ll be by later to catch up on what you’ve been writing. For one, I 100% agree with the idea of making a new game which focuses on the human/covenant war across different planets and colonies, rather than on the rings and the flood. You could really position this at any point in the timeline so as to provide the best battle scenarios. I really would like to see the Elites return as the primary enemy. I definitely agree that the Brutes would need some reworking to really contribute to the game, but I can’t even really think of how you would do that…and I wouldn’t miss them if they weren’t there. The number one thing I’d like to see in a new Halo campaign would be a serious, more realistic (Blomkampish) tone, and an enhanced focus on combat mechanics and AI. I would try to make the campaign combat match the intensity of a multiplayer match as much as possible. IMO an Elite should have equal health/shields and deal equal damage to the spartan player, and those values should not change across different difficulty levels. Ideally, the difference in the difficulty levels would entirely lie with how smart and aggressive the enemies were. Definitely agree about the AR – compress the old AR and old BR into one select fire weapon. With a good spread-bloom system, accuracy would be reduced during sustained auto fire enough to balance it out, while short bursts and rapid semi-auto would grant enough accuracy to go for head damage at mid range. I actually think there could be potential to use the fire mode selection as a wider overall game feature. The AR would be the primary reason to implement it, but it could be used in other weapons as well. For example, imagine switching modes on the Plasma Pistol – one mode being the dual function one we’re used to, one charge mode that automatically charges and holds an overcharge bolt until you pull the trigger, and “semi” mode that only fires the mini shots, but does so as soon as you pull the trigger rather than when you release it. You could also use such a command to adjust the rate of fire of the PR (ie 300/450/600 rpm) to manage damage vs overheating rate, or to toggle between magnification levels on the Sniper Rifle (5x/10x) or even the BR and Carbine (2x plus a 5x option). On the SMG – I think the way to differenciate it is ammo capacity and accuracy of sustained fire…it could even be changed to a very compact LMG (think mk46 mod 0). Firing a lighter round (even up to 5.56) it could deliver full auto with a tighter spread/less recoil than the AR for up to 70-100 rounds straight, at the cost of lighter per hit damage and no ability to go for pinpoint headshots. Of course I also agree with you on most other aspects we’ve dicussed in the past – i.e. semi-auto BR, health packs, fall damage, etc. As far as implementing different classes of characters, I can think of a lot of different ways to implement them. For example, when playing the ODST or any other human character, you might experience much more severe recoil effects on weapons like the SMG, AR, and BR…or even more realistic tactical shooter-ish characteristics like (basic/limited) posture/movement based accuracy and aiming only with whatever sighting was available on the weapon (irons, or scope). By comparison, playing the spartan you would have the superhuman strenth and coordination to fire the heavy recoil weapons to the performance we’re used to in Halo regardless of movement or posture. Due to the enhancements of the HUD, the spartan might be able to fire towards a projected reticule without actually using the sights of the weapon (due to cpu-managed eye/hand coordination). One thing I did in my last mod was make the 2x magnification universal to all weapons – this could be explained as a magnification feature of the spartan helmet/hud and not the optics of the weapons.